John Dehlin and Gina Colvin are coming to Sydney, Australia! We have scheduled a BEAUTIFUL beach front venue for October 20th-22nd, 2017. Click on the link to explore this amazing venue Collaroy Centre. Please note: All registration payment options below are in AUD currency. If we don’t reach the minimum amount of participants by September 1st, then all registration payments will be refunded. See all registration options below: – PLEASE NOTE **If you are unable to afford the registration fee please email us concerning a scholarship at openstoriesfoundation@gmail.com. Full Retreat registration in AUD currency (deposit participants) – this link is for those who have already paid the $50 deposit. 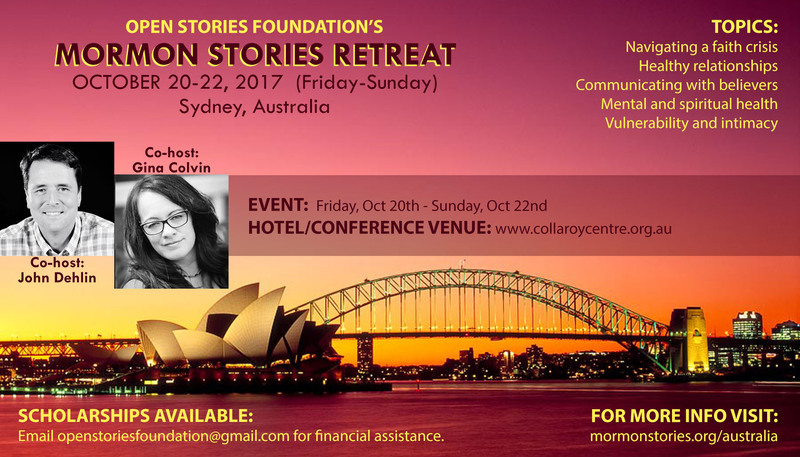 For Full Retreat registration in AUD currency (no deposit) – this link is for those who haven’t paid a deposit. For Single Day registration in AUD currency AND for those who haven’t paid their deposit.